The Innkeepers is a 2011 American horror film written, directed and edited by Ti West, starring Sara Paxton, Pat Healy, and Kelly McGillis. Claire (Sara Paxton) and Luke (Pat Healy) are two young employees at the Yankee Pedlar Inn, a once-grand hotel that is about to close. Claire and Luke are the only employees working during its final weekend of operation. Claire, who suffers from severe asthma, has recently dropped out of college, and Luke runs a website chronicling the hotel's supposed hauntings. Both are ghost hunting enthusiasts and are fascinated by the hotel's supposedly haunted history, which includes the legend of Madeline O'Malley, a bride who hanged herself in the 1800s when her fiancé 'jilted her at the altar' and whose body was supposedly hidden in the basement by the hotel owners. That afternoon, Luke checks in an older woman, whom Claire recognizes as Leanne Rease-Jones (Kelly McGillis), a former actress who is in town for an unnamed convention. While delivering towels to her room, Claire is starstruck and has an awkward encounter with Leanne, who is initially relatively cold toward her. The following night, while taking out the garbage, Claire notices Leanne watching from her hotel window. Claire waves to her, but Leanne ignores her and moves away from the window without acknowledging her. Claire hears noises coming from the hotel's garage, where there is a door leading to the basement. She padlocks the door and returns inside. She uses Luke's ghost-hunting equipment to record EVPs in various places around the hotel. While recording, she hears faint voices and music, and sees the grand piano in the lobby play by itself. She runs into Leanne in the hallway. Leanne reveals she is actually in town for a psychics' convention and that she has left her career as an actress to become a medium. She warns Claire not to go into the basement. Early that morning, Claire awakens to Madeline's apparition in her room. Later that day, an elderly man arrives and asks for a room on the third floor. Luke explains that the third floor rooms have been stripped of their furniture due to the hotel's impending closing. However, Claire offers to provide the man with a set of sheets as the rooms still have their beds, and she takes him to the honeymoon suite he requested. Luke and Claire decide to investigate the basement where Madeline's corpse was hidden. There they encounter disembodied voices and other paranormal activity and Luke becomes so frightened that he leaves the hotel. In a state of panic, Claire awakens Leanne and asks for help. Leanne goes to the bottom of the basement stairwell, where she makes contact with a spirit and then tells Claire that they need to leave the hotel immediately. Claire rushes upstairs to retrieve the elderly man, but upon entering his room, she finds a suicide note and discovers his body in the bathtub, his wrists slashed, with Madeline's apparition hanging from a rope. Panicked, she runs downstairs and finds that Luke has returned to the hotel. He goes upstairs to find Leanne and Claire hears more noises coming from the basement. She approaches the stairwell, where she is startled by an apparition of the elderly man. She falls down the staircase, injuring her head. Disoriented by her head injury, Claire is followed by the elderly man into the basement and finds herself in the room where Madeline's body was kept. She tries to open the door that leads to the garage, forgetting she had locked it. Confronted by Madeline's apparition, Claire dies of an asthma attack. The next morning, Luke tells police he heard Claire's screams coming from the cellar but could not open the door to save her. Luke and Leanne leave with the police. Leanne tells Luke that Claire couldn't have been saved. The film ends with a view of Claire's empty room where a barely-visible apparition of Claire appears, looking out the window. As she turns towards the viewer, the door slams shut by itself. In January 2010, Ti West was named as the director of the Dark Sky Films project. Sara Paxton, Pat Healy and Kelly McGillis signed on in May 2010. The film is produced by Derek Curl, Larry Fessenden, Ti West and Peter Phok. for Dark Sky Films in partnership with Glass Eye Pix. It was shot in Torrington, Connecticut. West shot several scenes in the actual Torrington, Connecticut Yankee Pedlar Inn. The film was shot on 35 mm film. The score is composed by American musician Jeff Grace. The film premiered at the SXSW festival in March 2011. Dark Sky Films set for a limited theatrical release on February 3, 2012. Ti West narrated and presented his film on the "Get Lit" Winter Party on December 22, 2010 in The Purple Lounge at The Standard Hotel on the Sunset Strip, Hollywood, California. The Innkeepers has received generally positive reviews from critics. 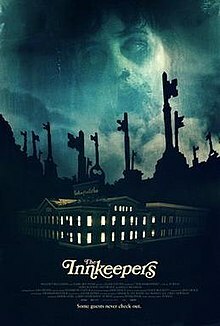 The film has a 79% fresh rating on Rotten Tomatoes based on 103 reviews, with consensus "It doesn't break any rules of the genre, but The Innkeepers serves as additional proof that Ti West is a young director that discriminating horror fans can trust". David Harley of horror movie review site Bloody Disgusting gave the film three skulls out of five saying that "once the tone shifts from light-hearted comedy to balls-to-the-wall horror, it makes the two halves feel like separate films" and that The Innkeepers is "just kind of disappointing". Others gave the film more favorable reviews, with Life After Undeath giving the film 8 out of 10 and saying that "it is a slow burn with a wicked punch and it is creepier than that one eyed whore with the deep voice you always avoid on your way back from the 'massage' parlor". Jeffrey M. Anderson of the San Francisco Examiner selected the film as the 8th best of 2012. Horror-Movies.ca gave the film a largely negative review stating that "nothing happens for a VERY long time, other than the old tried, tested, overdone and predictable jump scenes, and for a film that is over 100mins long, that isn't good." ^ a b "The Innkeepers (2012) - International Box Office Results". Box Office Mojo. Retrieved 21 April 2018. ^ "The Innkeepers (2012) - Financial Information". The Numbers. Retrieved 21 April 2018. ^ a b "Dark Sky's Innkeepers Next Project for Ti West". DreadCentral.com. Retrieved 2011-03-05. ^ "Another Photo From Ti West's The Innkeepers, Now With 100% More Orb". DreadCentral.com. Retrieved 2011-03-05. ^ "Ti West Tells Tale of Haunted Hotel in 'The Innkeepers'". Bloody-Disgusting.com. Retrieved 2011-03-05. ^ "First Look Inside Ti West's Haunted Tale of 'The Innkeepers'!". Retrieved 2011-03-05. ^ "Casting News on Ti West's The Innkeepers". DreadCentral.com. Retrieved 2011-03-05. ^ "Tour the Haunted Location of Ti West's The Innkeepers". DreadCentral.com. Retrieved 2011-03-05. ^ "A Look at Ti West's Haunted Location for 'The Innkeepers'". Bloody-Disgusting.com. Retrieved 2011-03-05. ^ "A Visit to Ti West's Haunted Hotel". Retrieved 2011-03-05. ^ "An Orb or Just Dust in New 'Innkeepers' Image". Bloody-Disgusting.com. Retrieved 2011-03-05. ^ "Exclusive Event Coverage: Dread Gets Lit with Lit Post and Adam Green". DreadCentral.com. Retrieved 2011-03-05. ^ "The Innkeepers". Rotten Tomatoes. Retrieved 2012-10-20. ^ "The Innkeepers (VOD)". Bloody-Disgusting.com. Retrieved 2012-01-25. ^ "Innkeepers, The (2011)". LifeAfterUndeath.com. Retrieved 2012-01-25. ^ "Various perspectives of the top 10 films of 2012". sfexaminer.com. Retrieved 2016-10-24. ^ "The Innkeepers Review". Horror-Movies.ca. Retrieved 2012-01-25. This page was last edited on 12 November 2018, at 18:38 (UTC).